There's been a weird quirk about Brian Azzarello's writing assignments for DC Comics: the less the super the hero, the more powerful his writing's been. Best known for his decade-long crime masterpiece 100 Bullets at the publisher's Vertigo imprint, Azzarello's also tried his hand at in its caped crimefighter universe, too. While his grittier sensibility meshed has well with Batman, his run at Superman felt like a square peg trying to fly through a round hole. So, when Azzarello was announced as the writer for the New 52 reboot of Wonder Woman, some wondered how he'd approach the most recognizable female superhero around. What's happened is that the Cleveland native's brought everything down to earth, including the Olympian deities whence Wonder Woman's roots spring. The Greco-Roman pantheon's always been one full of the foibles and failings of humans but Azzarello makes their betrayals, devotions, heartbreaks and power games feel more relatable than ever. The updated soap opera of immortals gets blended with a subtext of horror and submission swirling through everything, too. 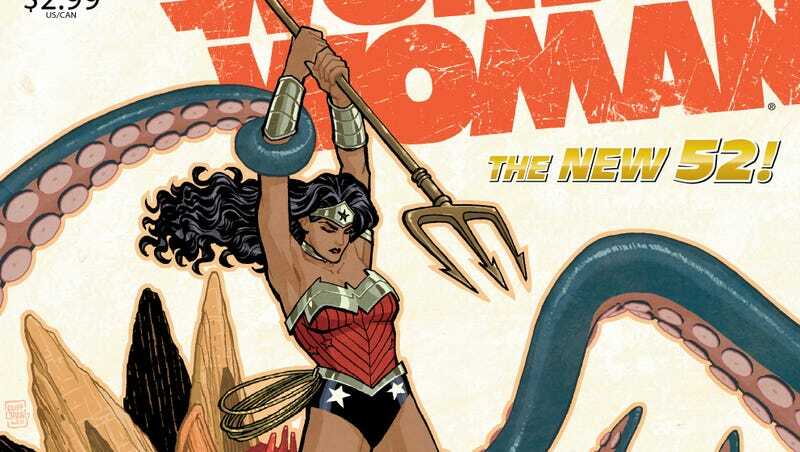 As for the lead character, Azzarello's transformed Princess Diana of Themyscira into an Amazonian equivalent of a twentysomething young adult striking out on her own. There's finding out your parents aren't who you thought they were, leaving home and losing yourself to a new world. Despite the drama in Diana's own life, an innocent woman—who happens to have been impregnated by Zeus—who still needs defending. This preview of next week's Wonder Woman #5 show more of the mythological sphere colliding with the human world. But the predators may not necessarily be who you think. Click on the pages below to preview the first five pages of the next issue of one of the best superhero comics being made to day. It'll be out this Wednesday in comics shops and digital comics storefronts everywhere. Click each page for a larger version.